This is a great time of year here on the Gulf coast. It’s still hot–though it was down below 80F/26.7C early this week, which can feel darn cold when you’ve been at 90F (32C) or hotter since May! The magnolias in the front and back of the house are getting lots of ripe cones on them. Our yard magnolias bloomed like crazy this year, so lots and lots of cones. 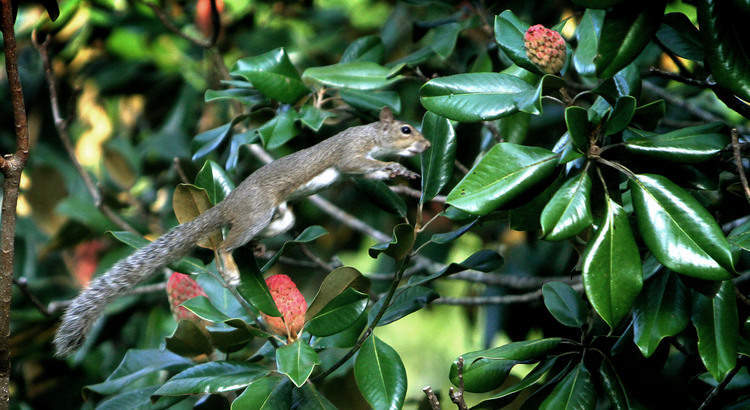 The picture I found had a squirrel in it–squirrels and birds love the seeds on the cones. They also like the –I guess they’re dates on a neighbor’s palm tree, but they’re not the kind of dates people eat. They look like little fibrous dates, though, and they grow on a palm, so they must be related. It’s high living for the birds this time of year. All the seabird babies are getting big enough to go out and find their own food. I saw an actual Vee of pelicans this morning when I was walking. Usually pelicans don’t fly in vees. They seem to be always in straight lines–unless there are lots and lots of them flying together, and this group had 30 birds. Usually, they’re in lines of a dozen or less, but 30!! Might have been more–I was counting really fast. I saw a baby laughing gull this morning too. The babies are as big as their parents this time of year, but their feathers are still brown, rather than gray and black. The white’s coming in, but not the gray. I went to see the parents at the end of last week. Daddy’s cataracts are apparently pretty bad–he’s very uncertain in his walking, especially going up and down steps, because he just can’t see where he’s going. He sticks close to the wall and holds onto the handrail for guidance–which is better than just blithely strolling down the middle of the hallway. If the doctor thinks he’ll leave his eye alone after the surgery, we’ll probably have at least one eye operated on. He just can’t be picking at it afterward, and since he won’t be able to remember he had surgery, it’s an issue. Still, he hasn’t been picking at his face lately, so maybe he won’t. Mother’s about the same…she’s starting to read her books over again because she can’t remember what was in them. But I read books over too, so– I do it because I can’t remember if I’ve read them before or not, and then I read them and realize–yes, I’ve read this. Oh well. I’ve been writing a little bit. I’m kind of in a “what do I want to work on now” situation. I’m not sure what I’m in the mood to write–and unfortunately, right now, I seem to have to be in the mood, or nothing gets done. So I’ll think a little and get out files and re-read a little and see what strikes me. Maybe I’ll clean up my desk too.